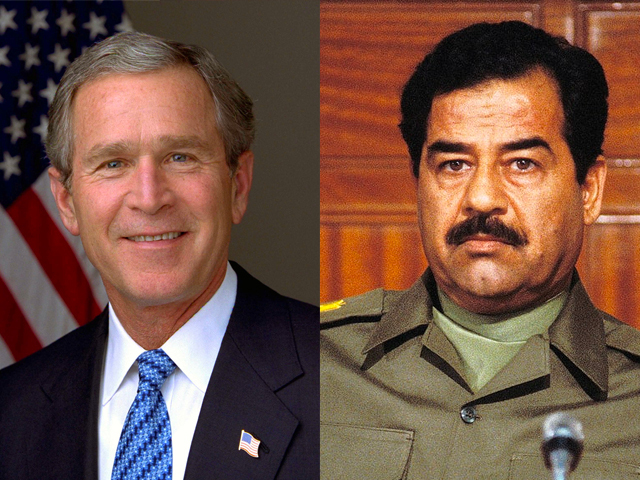 The character and personalities of George W. Bush and Saddam Hussein have been analyzed using the psychological characteristics of non-verbal body language, facial expression and body structure. The assertions made are solely those of the author and have a basis in psychological theory and experimental research. The author has attempted, as an American, to keep his personal bias out of the core analysis. If I were a betting man and George Bush and Saddam Hussein entered the ring, I would give you 4-1 odds that George would beat the pants off Saddam. The president is a well-packaged bundle and, although Saddam seems bigger, his vulnerability lies in his stomach area and his fragile leg/feet area. This should be the area that George concentrate on in mounting what could be an effective campaign against Saddam in launching a psychological war. Saddam over indulges himself in most areas of his life. This includes food, emotion, moods and peacocking. On the other hand, George is more restrained, tending toward moderation in many things. At times this restraint is overdone. George is often a perfectionist and this, rather than a "lack of intelligence," inhibits him from seeing the bigger picture. George frequently sets unrealistic standards for those close to him and, from time to time, people might see him as domineering. George's restraint is apparent in his bold and stiff walking style. He is anxious concerning approval from those he regards as authorities. George was easily shamed as a youth and this explains what newscasters call his hesitant and sometimes confusing use of language as well as his sometimes embarrassing facial expressions. Don't let this deceive you, however, as George knows what he wants and knows what he is doing. Notice how much more relaxed and direct he is on his ranch. He should spend more time at the ranch and deliver some "talks" to the Nation from that location. George doesn't like holding back how he really feels, but he has been well trained as a politician. Because of this conflict, he appears to some less intelligent than he really is. Unlike Clinton, it would be more obvious if George boldly lied about his personal life on National television. He has a more difficult time controlling his involuntary facial expressions than most public figures. In our society, verbal skills are regarded as a sign of intelligence when, in fact, many people can be very expressive and glib without having insight, structure or factually-based arguments. In fact, George was at a handicap relative to presidential candidate Al Gore, but George is more credible than Al, regardless of Gore's superior ability with language and rhetoric. George does have a real sense of integrity. He can't help this — it is part of his true nature. He prefers straight talk even if he disagrees with you. He can be very aloof at times, but this doesn't mean he hasn't heard what you said; it simply means he is thinking about it. He cares for people more than he would like to admit and, when he appears teary, he really is. It is hard for him to be an actor when it comes to his true feelings. It is much easier to get to know Saddam than George. George is moderately suspicious of others, although he can be very friendly and trusting when relaxed. He is dependent on the emotional support of his wife and regards her highly. To get along well with George it is important to let him know that you have no desire to embarrass him. He responds well to direct and honest communication; however, as a politician, he has become used to deception. He no longer takes seriously the negative press he receives. However, if he values you and you do betray him, he is deeply wounded and could easily become vengeful. George's early drinking and use of alcohol was an attempt to reduce his fear of embarrassment and anxiety over his personal self-worth. George's seeking of perfection has often made him highly critical of himself and, at times, he has felt almost "paralyzed" by this character trait. Saddam is acutely aware of this and will play on George's fear of making either a real or imaginary mistake. Saddam is very aware of how public opinion and not facts rules the action of America. What Saddam doesn't realize is that George has become used to being made fun of. In fact, all of the ugly press about George's lack of good grammar and syntax as well as his clumsy personal appearance has made George a lot stronger than most people think. In other words, George's anxiety and fear of shame and perceived weakness have made him a formidable opponent. Saddam is very moody and unpredictable and, like many of his dictatorial brethren, he is either "at your throat or at your feet." He is the true archetype of the "bully." He suffers from a pathological distrust and is continually scanning his environment to find enemies and plots. He distrusts the motives of everyone and often complains about his advisors. He is very hostile and stubborn, and is easily defeated by setbacks. In other words, it takes him a longer time than George to recover from a blow to his softer underbelly. Unlike George, who has learned to accept his more tender feelings, Saddam has all but murdered his. From time to time Saddam indulges himself with the thought that he is a caring and loving person who has been misunderstood and mistreated by others. Saddam is rigid. This makes him vulnerable. He will often stick to a plan even after it has been proven wrong. Once he has made a decision, any change will be perceived by him as a sign of weakness. Once insulted, whether real or imaginary, it is very unlikely that he will forgive you — assuming, of course, that you survive. George has hurt his feelings and Saddam can't rest until he either harms George/America or humiliates him. Saddam saw 9-11 as the castration of America and takes delight in knowing that he played a significant part in supporting bin Laden's plans. A strong and consistent stance with little waffling will bring him to his knees. However, it is important not to feed him with emotional diatribes. He thrives on attention whether negative or positive. In fact, he prefers negative attention as it confirms his view of himself as a persecuted mini-messiah. Saddam cares for no one. His goal is pure power, power for its own sake. He has few if any moral principles and, while shaking your hand and smiling, he could easily shoot you in the back. Saddam is prone to throwing fits and, when thwarted, will either strike out in anger or become severely depressed. He tends not to re-evaluate his actions and has little insight into himself. I wouldn't be surprised if he often thinks of suicide when his homicidal efforts fail. Nor would I be surprised if he is taking anti-depressants. His character is such that he has suffered from deep depression most of his life. If I were forced to label him it would be "anti-social paranoid schizophrenic." Saddam is a good speaker, highly manipulative and enjoys the sight of people squirming in the face of his power. At times he can be very benevolent toward others, simply for the sake of feeling his own power. His delusional nature, evidenced by his behavior in public appearances, and coupled with his patterns of speech in formal addresses, tends toward a thinly-veiled sadistic personality. In turn, this produces attacks against him: attacks that he requires in order to prove to himself, to his people and to the world at large that he has genuine enemies who will stop at nothing to overthrow him. It is fundamentally important not to feed this. Rather, to successfully negotiate around this personality type, it is better to treat him with indifferent consistency. This will force him to escalate his behavior to find slights and to justify his fears and aggression. This will cause him to make mistakes as his behavior is also motivated by deep fears of sexual inadequacy. Saddam has a very active idiosyncratic fantasy life and believes he has extraordinary powers to see into the future. He may even hear voices which he interprets as messages from the "gods or spirits." He doesn't budget money well, oscillating between extremes of overspending and withholding. He is the type of person who might spend a large amount of money on security while at the same time leaving the front door wide open. The idea that Americans are supporting his fallen thousands by charity is very entertaining for him. He uses the weak and lame as a foil for worldwide support. He doesn't respond well to criticism, so everyone must talk to him in metaphor. He would much prefer to have Al Gore as President than George. He is testing George, but consistency will teach him that he can't manipulate George by the misuse of public opinion. Saddam is very calculating; however, his calculations are based on delusional assumptions. He has always played on other people's "moral principles" and is acutely aware of America's fear of being seen as the bad guy. Saddam is very aware of George's enemies and I wouldn't be surprised if he his interacting with some of them, if not directly, then by misdirection and intrigue. If America didn't exist, he would have to create it. Without enemies his peculiar form of pathology would destroy him. However, playing the game he enjoys most will, in the end, destroy him. He is thrilled by walking the tightrope and loves to see how much he can get away with before he must, again. retreat. However, with every adventure he recognizes that he gains both time and support. What he doesn't like to think about is that, like a naughty child, sooner or latter he will be spanked. He secretly would like to die and take the world with him. Death is the only solution to the painful tension he feels. Saddam appreciates drama and, if Iraq is destroyed, he will not mind it very much. Like Hitler, he would rather see his country destroyed than exist without him. I wouldn't be surprised if he is addicted to some "prescription" drug or indulges in alcohol "in private." Because he has strong fears of being poisoned and controlled by "substances," he might be reluctant to indulge too heavily until he feels safe. His Messianic delusions are continually frustrated by the "evil empire" (the United States) and he thrives on the weakness often demonstrated by the United Nations. Saddam takes pleasure that he has fooled most of the world by his trickery and he is well aware that, similar to pre-World War Two "thinking," people prefer to stick their head in the sand rather than be proactive. In the end, Saddam's delusional world will be destroyed; he has forgotten that people can only be fooled so many times before apathy is replaced with fearless action.